The final report of Anna Klonowski Associates Limited was published as part of the Cabinet agenda of the 12th January 2012. Wirral Council also received from Anna Klonowski Associates sixteen appendices (listed below), which apart from appendix G (Standards for England decision notices) have not been published. If Wirral Council is now “open and transparent” when will the other fourteen appendices be published (except for appendix L)? A brief explanation about some of the acronyms used above. DASS refers to Department of Adult Social Services and WMBC to Wirral Metropolitan Borough Council. Service Provider 2 was Assisted Living Services (ALS), Service Provider 3 was Salisbury Independent Living Services (SIL) and Service Provider 4 was Options for Living according to this key to the terms used in the Anna Klonowski Associates report. The answer given by Graham Burgess (unfortunately he didn’t give a separate answer for each appendix) and starts at 6:12 in the video above was, “Just a response to the first question which relates to a whole series of appendices to the AKA report. Our view is that all those appendices actually contain very sensitive personal information and to release those appendices would be in breach of data protection and also the duty we have to individuals that gave us information in confidence or relating to their own personal, medical or financial circumstances. Therefore it’s our view that it would be inappropriate to release those documents as they contain a whole host of sensitive information. Graham Burgess responded, “Can I also say Chair, that with your agreement it would be the intention of the Council to print all these questions, to place all these questions on our website and all the answers to them as well so they can be unearthed by people who couldn’t make this meeting so they could see what was said and what we’re saying. Below is the first appendix I asked to be published, appendix B (Equality and Human Rights Commission Letter Dated 29 December 2010) supplied by Paul Cardin (not Wirral Council), who has further information on some of the background to the letter in a blog post headlined “The Saga of DLA Piper – can the truth finally be allowed to emerge? Er, not yet…”. You can click on the image of the letter for a larger image, but as search engines can’t spider images, the text of the letter is also included below it. In response to your letter of 9 November 2010, in which you outline Mr. Cardin’s concerns that the overcharging of disabled residents amounted to discrimination. I do not agree with the conclusions drawn by the Council’s Director of Law namely that discrimination did not occur because the residents were not overcharged for reasons relating to disability. Current discrimination law and supporting case law clearly establish that motive and intent are irrelevant to this issue. The facts are that disabled people were subject to unlawful levels of charging (whether or not the cause was maladministration). It is therefore the opinion of the Commission that Mr. Cardin’s concerns should be included in the Inquiry, in order to identify whether there are other issues or systemic problems that need to be addressed. Furthermore inclusion of Mr. Cardin’s concerns in the Inquiry will assist the Local Authority in communicating their commitment to fully investigating this matter. So going through the list of reasons Graham Burgess gave for not publishing appendices such as these. 1. Does it contain “very sensitive personal information”? No, it doesn’t. It does contain Paul Cardin’s name and if Wirral Council wished to protect his privacy it could easily have been released the letter with his name blacked out. 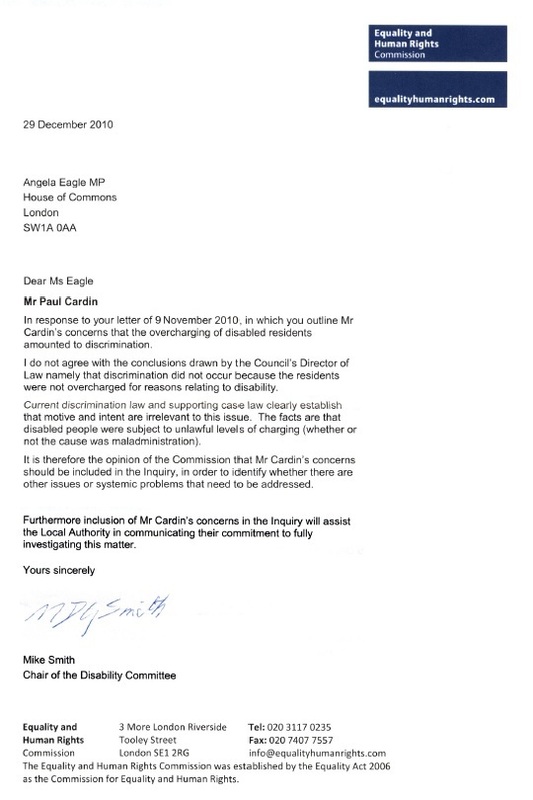 However I had Paul Cardin’s permission to republish the letter without any redactions. 2. Would it be a breach of the data protection legislation for Wirral Council to release and publish such a letter? In my view no (apart from the point about whether Paul Cardin’s name should be included when published or not). Wirral Council have been criticised in the past for using the spurious reason of data protection legislation to try and stop filming of their meetings so I don’t think they’re as familiar with this legislation and case law on the subject as they claim to be. My own personal experience is that I’ve previously won a case (in 2012) in the Birkenhead County Court involving a breach of the Data Protection Act 1998 where one of the two defendants was a Wirral councillor. Sadly it seems at least one Wirral councillor has very little understanding of the data protection legislation. 3. Would it breach the duty Wirral Council has to individuals that gave them information in confidence? No, this is a letter written to Angela Eagle MP. I very much doubt that Mike Smith was told by Anna Klonowski Associates Ltd that his letter would be kept confidential or that he was providing it on these terms to Anna Klonowski’s investigation on those terms. 4. Does it relate to personal, medical or financial circumstances? No, it does relate to overcharging but not in detail. This however brings us to a final question which seems to be the crux of the matter. 5. Would releasing or publishing a letter from the Chair of the Disability Committee of the Equality and Human Rights Commission that states that disabled people were subject to unlawful levels of charging which amounted to discrimination, which contradicts the legal opinion of Wirral Council’s former Director of Law be something that would be embarrassing to Wirral Council? The answer to that one is yes. As usual comments on this matter are appreciated. plus from AKA Ltd report. Well your sentiments chime with the question I asked on Friday. For some reason though Wirral Council didn’t seem to want to go down the path of full disclosure (although I await Graham Burgess’ response to my supplementary with interest) as I think they fear it’ll open up a can of worms and lead to more questions being asked by the public about an episode in Wirral Council’s history that some people would prefer was forgotten? Councillors have a duty under the new code of conduct arrangements to be honest and to be as open as possible about the decisions they’ve made and the actions they’ve taken including reasons for those actions and to restrict information “only when the wider public interest clearly demands”. Just to reassure the public, I won’t be forgetting this. Wirral Council, having lost the first battle, are digging deep into the coffers (well whyever not? It’s not as if it’s their own cash) and are appealing it to the First Tier Tribunal. Are you referring to the FOI about the cicumstances surrounding two senior Social Services managers leaving the employment of Wirral Council, paid off to the tune of £110k each the day before the Anna Klonowski report was published or something different?